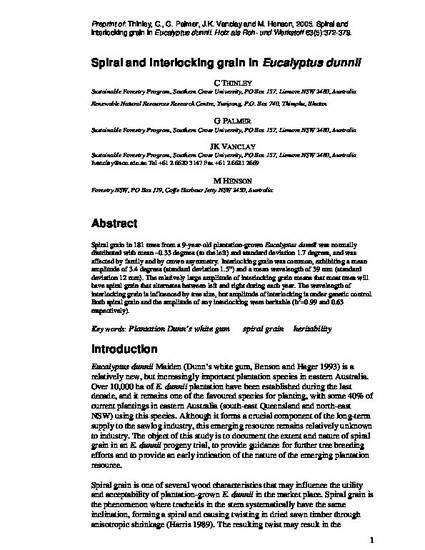 Spiral grain in 181 trees from a 9-year-old plantationgrown Eucalyptus dunnii was normally distributed with mean −0.33 degrees (to the left) and standard deviation 1.7 degrees, and was affected by family and by crown asymmetry. Interlocking grain was common, exhibiting a mean amplitude of 3.4 degrees (standard deviation 1.5◦) and a mean wavelength of 39 mm (standard deviation 12 mm). The relatively large amplitude of interlocking grain means that most trees will have spiral grain that alternates between left and right during each year. The wavelength of interlocking grain is influenced by tree size, but amplitude of interlocking is under genetic control. Both spiral grain and the amplitude of any interlocking were heritable (h2 = 0.99 and 0.63 respectively). Pre-print of: Thinley, C, Palmer, G, Vanclay, JK & Henson, M 2005, 'Spiral and interlocking grain in Eucalyptus dunnii ', Holz Alz Roh- und Werkstoff (European Journal of Wood and Wood Products), vol. 63, no. 5, pp. 372-379.